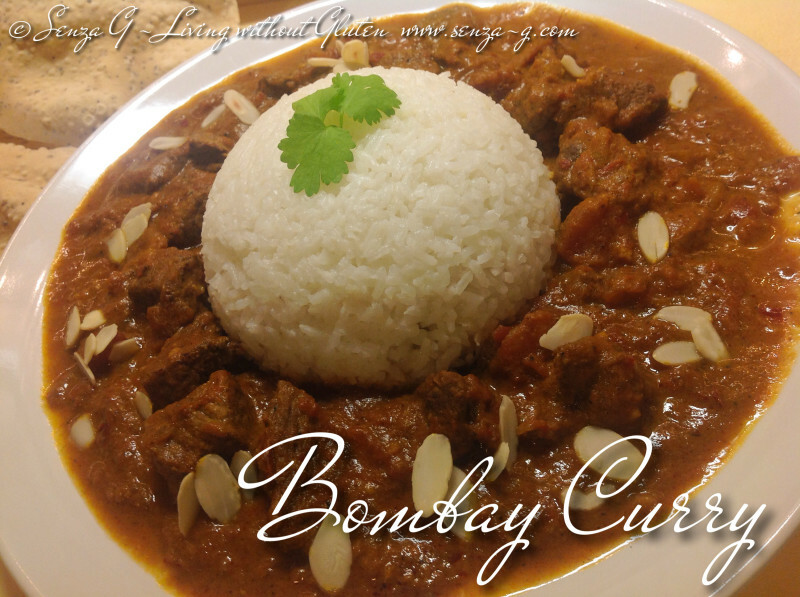 A tried and tested recipe for delicious Bombay Curry, an easy from scratch curry. Make it as hot or as mild as you like by adjusting the chilli amount in the recipe. Sautee the onion in a little vegetable oil until it is translucent. Add all the spices, stirring well over medium heat. Increase the heat and add the meat cubes, stirring until they are all coated with the spice mixture and they brown all over. Lower the heat, add the minced garlic and the tomato paste and give it another stir. Now add the chopped tomatoes with their juice, the water, the gf stock, salt, pepper, bring to a boil, and leave to simmer for about an hour and a half. Add the coconut milk and simmer for another 15 to 20 minutes until the sauce thickens. Serve sprinkled with toasted flaked almonds, boiled rice, poppodums and fresh coriander.